Most individuals would probably be satisfied if processes were followed to the letter 99 percent of the time, but let’s put that into context. If things are done correctly 99 percent of the time, that equates to two unsafe landings at Chicago’s O’Hare International Airport each day; 16,000 pieces of lost mail each hour; 20,000 incorrect drug prescriptions each year; or 500 incorrect surgical procedures completed each week. In manufacturing, the slightest of errors, for example one-tenth of a percent, can have a significant impact on a company’s financial performance and profitability. Manufacturing errors are typically a result of missed process steps, mis-set work pieces, faulty machine operation, adjustment errors, setup errors, or bad tool or fixture preparation. Eliminating product defects through error-proofing will yield better quality, lower costs, better predictability, less rework and redundant inspections, improved scrap rates, and reduced variability, because the part will be manufactured right the first time. Because it aims to reduce defects, error-proofing is a key component of lean manufacturing. Error-proofing impacts every area of lean manufacturing, including inventory, processing, correction, overproduction, motion, material movement and waiting. In short, error-proofing and lean manufacturing both aim to eliminate any activity outside the normal value stream. For example, the results of error-proofing can easily be seen in the area of overproduction. Manufacturers may make the decision to overproduce a part because a certain scrap rate is expected. In this case, manufacturers have introduced more waste into the process. Effective error-proofing can eliminate the need for overproduction by producing the parts correctly the first time. Error-proofing is a method of 100 percent inspection at the source, rather than down the line. In essence, error-proofing improves the predictability of the resultant part of the manufacturing process. Therefore, the actual inspection time, which is non-value added time in the process, is reduced. Each process hand-off must be a perfect product for the next downstream process. This concept is known in the industry as “Poke-Yoke.” There are several examples of Poke-Yoke in everyday life. For example, childproof caps on medicine bottles prevent toddlers from opening the bottle and ingesting harmful substances. Another example is the brake/shift interlock mechanism in an automobile, which prevents the car from being started unless the brake or clutch is depressed. In each of these circumstances, an error is prevented because of a fail-safe system. There are also several industry examples or Poke-Yoke in use today. Barcode scanning at a grocery store speeds up the check-out process and eliminates errors caused by entering the wrong price. Torque limiters on assembly tools that prohibit users from over-tightening bolts are another example. There are several Poke-Yoke techniques specific to manufacturing that can be used to error-proof processes. These include program simulation for crash avoidance, fixture considerations, tool-setting automation, tool condition monitoring, safe programming considerations, and machine monitoring methods. One error-proofing technique relevant to fixtures is the use of continuous pressure hydraulics (CPH). CPH, developed by Makino, utilizes live hydraulics in the work zone to improve the clamping process by maintaining the correct clamp force for the specific application. By ensuring consistent clamping pressure, manufacturers can keep the part from deflecting during machining. This guarantees that each part will have the same surface tolerance, eliminating variability. Another aspect of the CPH system is an air circuit in the supply system, which is used for part sensing. When a part is placed on the fixture, the CPH system uses bursts of air to monitor the back pressure to ensure the part is located correctly. If the air circuit determines the part is not correctly attached, the operator is warned and can correct the placement before moving forward. Using this process, the machine ensures the part is located correctly, eliminating further errors in the machining process. Another mistake made during the manufacturing process is mis-setting a part into the machine fixture. This can easily occur if a piece of debris is blocking one of the indicators, causing a part to be incorrectly positioned by as little as five to ten thousandths of an inch. This results in an inconsistent part. To remedy this, Makino’s CPH system uses a coolant flushing system in the center of the fixture that removes debris before it can block a sensor. Finally, Makino machines utilize electronic sequencing to control the fixture’s clamping system. This ensures consistent clamping pressure is applied to every part, eliminating the risk of mis-setting the part in the fixture. Other Poke-Yoke techniques include using guideposts to prevent mis-loading of the part or using silhouettes or diagrams to ensure the operators know the correct orientation of the part when placed on the fixture. There are also several Poke-Yoke techniques that can be used during the programming process. Tool path verification software simulates tool paths, enabling the operator to check for tool collisions before actually machining the part. The software virtually machines the part and alerts the operator to any conflicts between the tool and the fixture or between the spindle snout, tool, and the table. This can be extremely valuable when doing low-volume manufacturing, which requires a lot of programming and first-time setups. 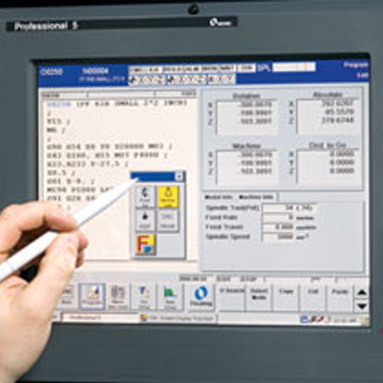 It is also important to remember that CAM systems or post-processors could also introduce errors into CNC programs, so certain programming considerations must be taken into account. Often, machine operators need to stop and restart midway through a part program. This presents a high risk of error. 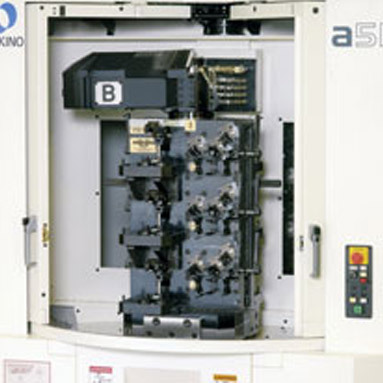 To eliminate stop/restart programming errors, Makino incorporates a Poke-Yoke process, called Safe Start, into its CNC programs. Safe Start uses a “safety line”—the first line of the program—to establish the conditions under which the CNC will operate. A safety line is also located before each tool change. This allows an operator to safely restart programs by cancelling out and establishing a baseline condition for the machine tool and every tool change. Then, once the new tool is in place, the program establishes and re-establishes the conditions in which the machine operates with the new tool in terms of work offsets, tool offsets, and cutter radius compensation. This goes a long way in terms of eliminating errors that might occur as a program is stopped and restarted before a part is completed. Another error-proofing technique Makino has included in its CNC programs is “Geometric Intelligence,” which is very useful in high-speed machining. This function allows the programmer to program the machine to perform at the level needed for a given application. For example, an application may be less concerned about accuracy and more concerned about speed and removal rates during a high-speed machining process. The geometric intelligence function programs the machine to prioritize speed over precision. This falls into the category of error-proofing because a programmer may set an incorrect operating speed, resulting in a scrap part. Using the geometric intelligence function, the programmer only needs to input the proper code based on the desired accuracy, and the machine does the rest, greatly reducing the potential for error. Errors caused by erroneous tool data are among the most frequent in the manufacturing process. To mitigate tool data errors, a Balluff Sensor can be used to read accurate data from each tool into the machine controller rather than manual input. This is accomplished via a read/write chip embedded into each tool with data such as tool diameter, length, and tool life remaining. This greatly reduces errors by automating the otherwise human process of entering the tool data at the machine. 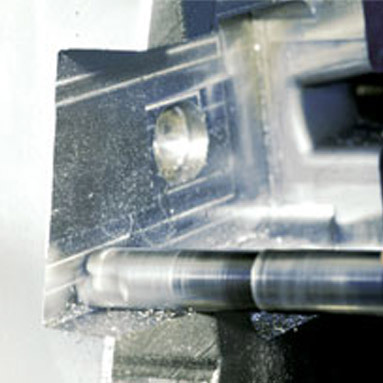 “Offset checks” is another Poke-Yoke process that Makino incorporates into its part programs. Offset checks use a macro program to check and offset tool value to confirm it is within a nominal value. This provides an added safety measure in case an incorrect value was manually entered into the system by the operator. Another problematic area in the manufacturing process involves locating the pallet to the machine tool. Typically, a pallet is secured to the machine by hydraulic clamps that use sensors to ensure the pallet is accurately aligned. It is possible for chips or other debris interfering at the locating point. If the pallet is out of alignment in the slightest, the fixture and part will also be misaligned causing further machining errors. To remedy this, Makino employs an “Automatic Pallet Confirmation” function on all of its horizontal machines. This function uses an air circuit built into the locators to detect the slightest misalignment of the pallets. If the pallet is misaligned, the machine will automatically attempt to reset the pallet by picking up the pallet and re-cleaning the locating positions. If misalignment recurs, the operator is alerted and is able to correct the process before machining begins, reducing further errors. Another method of error-checking on the machine itself is something called “BTSOMA,” which is an acronym for Broken Tool Sensor Outside the Machining Area. This system simply confirms that the tool has not been broken and that it is still securely locked in the collet, eliminating the possibility of a broken tool contacting the part. If the system discovers a broken tool, the operator is alerted and the process is stopped until the tool is corrected. Spindle load monitoring is another Poke-Yoke technique that eliminates errors resulting from tool breakage. A spindle load-monitoring system monitors the energy being used by the motor based on the condition of the inserts of the tool. If the average draw increases too high, the machine stops the process or activates a redundant tool. This system eliminates tool breakage and scrap by stopping the machining process due to spindle overload. It can also detect improperly loaded parts due to “no load” condition during the machining cycle. While errors can’t be completely eliminated from the manufacturing process, fail-safes can be implemented to ensure human errors don’t translate into manufacturing defects. By implementing fail-safes in the fixture, tooling, programming, and machining processes, errors can be quickly identified and defective parts removed from the process before they cause greater problems down the line. By error-proofing these processes, manufacturers can improve quality, reduce waste and costs, and improve global competitiveness. For additional information on error-proofing, please contact Tim Jones, Horizontal Machining Center Product Line Manager, at (513) 573-7249 or by e-mail at Tim.Jones@makino.com.